This is a gorgeous wedding garter set. You get both garters pictured. The 1.5 inch black lace is elastic and stretches. The shabby chic rosettes are 2.5 inches each and are backed with felt to ensure comfort on your leg. 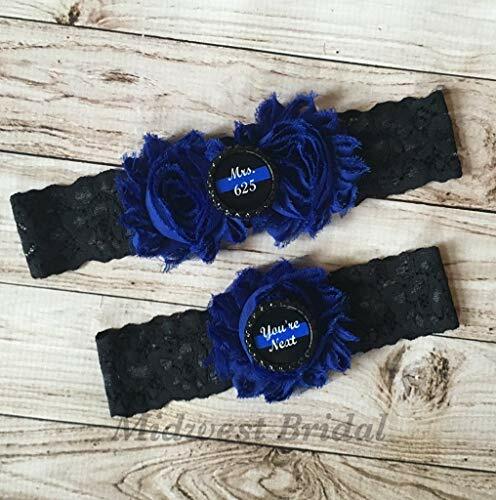 This set is topped of with a customized image on each garter. Accurate Sizing is crucial for a custom fit, so please follow sizing directions below. Please see shop announcements/banner for current processing times of garters. If you have any questions ask all, please ask!! Garters are shipped in a white keepsake box with a cotton insert. Please be sure to leave the badge number you'd like on the keepsake in the notes upon checkout!!! SIZING DIRECTIONS 1. Using a flexible measuring tape, measure around the circumference of your thigh where you'd like to wear your garter. This is typically 4 -5 inches above the knee. If you do not have a flexible measuring tape use a string. Mark the string right where it meets and measure. 2. DO NOT take any inches off of your measurement. I have been making garters for several years and know how much to take off for a good fit. 3. Provide your exact measurement in the dropdown box upon checkout. If you have any questions about this product by Midwest Bridal, contact us by completing and submitting the form below. If you are looking for a specif part number, please include it with your message.